As I've posted about before, we're beginning a campaign arc for OCI called "Sky Racers Unlimited." When the group chose this as one of their portals, I knew I wanted to do something weird and more crunchy. Normally Action Cards is a little more crunchy than Fate (advancement, damage). 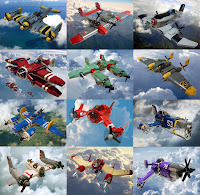 But I wanted to be able to use all of the cool Crimson Skies planes I had and borrow a bunch from X-Wing mechanics. I wanted the dogfighting to be less abstract and allow players the chance to customize their own planes. So below you can see the bastardized system I've come up with. I have no idea if it is going to work, and more importantly, if it will be fun at the table. At the very least it should look cool. It's a good group and they're pretty good about adjusting values and making changes as we play. Each player will build their plane as they’d build a character. You begin with a chassis and then can add on to the basics of that. Stunts act as the currency to buy these things. Planes come in one of three categories: Light, Medium, Heavy. That affects how much they can add, how fast they can go, how they move, and how tough they are. Each plane type has a movement template, damage tracks, and a capacity. A movement template shows which moves you can pick at the top of each round. Better handing planes can go further and have more “green” or easy movement you can use to gain an advantage. Planes which handle worse will have more “red” or difficult movement which cause stress. You can find more on that in the Flying & Fighting section. Just like characters, planes can take damage. Every plane has a damage track, system boxes, and the usual armor & damage resistance values. Planes can also take tags and consequences. Just like character consequences, plane damage effects get added to a player’s deck. They clear at the end of a scene if the player has access to a mechanic and supplies. Each plane chassis has a weight limit, representing how much more cool stuff you can attach to the plane. It also limits the # of different weapons you may attach. In play, if a plane goes over their weight limit for some reason (jamming extra people in), they suffer from the “Overloaded” tag. You have 5 Stunts to spend on your planes. You may give up a character Stunt for an additional Stun to spend here. Starts with no DR and 6+ to damage (max DR 1 and 7+ to damage). Starting damage boxes: 1, 2, 3. May equip up to 5 weight in add ons. May purchase “Light Only” systems. Up to two weapon points. Starts with no DR and 6+ to damage (max DR 2 and 7+ to damage). Starting damage boxes: 1, 2, 3, 4. Up to three weapon points. May equip up to 7 weight in add ons. Starts with 1DR (counts as an armor upgrade) and 6+ to damage. (max. DR 2 and 8+ to damage). Starting damage boxes: 1, 2, 3, 4, 5. May equip up to 8 weight in add ons. Up to four weapon points. May purchase “Heavy Only” systems. All planes begin with one front or rear mounted machinegun (2+5d damage). You may swap out your machine gun for these weapons marked with * at with a reduction of 1s, .5w). Each player has a plane, mounted on a rectangular base. You use your standard deck for making checks while flying. At the beginning of each turn both players and the GM set their movement by marking it. Then we run through the turn as usual, with players picking initiative order and passing. On your turn, you will move based on your selection and then carry out any actions. 2 Move Straight and then Reverse Your Direction. There are a couple of other movement exceptions explained below. Movements marked in Red are stressful. When you do these, you have a -1 to actions until you clear the stress. You can clear these on the following round by doing a movement marked Green or by making a Pilot test and taking 2 damage. If you are Stressed you may not do a movement marked in red. If you end your movement in contact with another plane’s base, make a Pilot check. If you fail you may either do 2 damage to your plane or lose your action. Alternately you may choose to do 3d to both planes and lose your action. In any case, move your figure so that bases are just in contact, not overlapping. All planes are on one of three relative altitudes: Low, Medium, High. You may change one altitude per movement. You must be Low to attack ground targets. Difference in altitude affects attacks and some maneuvers. You don’t have to mark altitude changes when you plot your movement. Stall: You may stall out to suddenly stop movement. You cannot have moved more than a 3 on your previous turn. Stalling is stressful. When you stall, you stay in place and immediately drop one or two elevations. You gain +1 to defenses that round, but must make a piloting check on the following round to avoid plane damage. You randomize your facing afterwards. Your next movement cannot be greater than three. Barrel Roll: Light and Medium planes may perform sideways rolls. At the end of movement, you may opt to make a simple Piloting check. If you succeed, you may shift your base to the side in either direction by one base width. Sometimes there will be terrain which interferes with the battle (mountains, towers, stationary objects in flight). Planes which end up within a base width of these may invoke them as bonus if someone’s attacking them from the other side of the terrain. The tradeoff is that passing above or within a base width of such a terrain requires a piloting check. On your turn you may perform actions, including attacking. A good deal of the time you’ll be performing maneuvers to aid allies and set up enemies. Sometimes you’ll be doing something to change the situation, and sometimes you’ll be tagging someone with an effect. In mechanical terms, this is creating an aspect. It’s especially important in dogfighting. In order to do full damage to a target plane, you have to activate an aspect on the target. Otherwise you do partial damage. Usually this will involve things like moving to get the plane in your sights, tipping the wing, playing chicken, diving out of the sun, reading their patterns, and so on. You just have to describe the maneuver you’re pulling off. You make a test, resisted by the opponent. If you succeed you tag them and set them up. This gives you a free invoke for doing full damage on them. You can also use it for the usual purposes. Maneuvers will use different result types depending on the maneuver you describe. Generally if the maneuver revolves around daredevil flying, you use Piloting for repulls. If it involves perception and calculation, you use Navigation for repulls. Aspects created via maneuvers can be invoked by any of your allies. The Golden Rule of Maneuvers: Pilots are smart and learn from past mistakes. Therefore you cannot describe the same maneuver or trick twice in the same combat. Clearing Aspects: Invokes on aspects clear after you use them. A pilot may also spend their action to clear an invoke (more with a strong Piloting test). As well, because of the high-speed nature of a dogfight, any aspect you create is fragile and will go away after your next action. Consequences from damage on enemies can also be invoked to do full attacks. Tailing: If you end your move in the rear arc of an enemy plane after both of you have moved, you may attempt to create a special aspect: Tailing. You must be on the same or higher level. You repull with Navigation for this test, the target plane repulls with Piloting. Tailing works like other aspects, but with a bonus. Before movement the next round, that pilot must declare if they are going Straight, Left, or Right. Shaking a Tail: Clearing a Tailing aspect requires an active test of the escaping pilot vs. the plane on their tail (rather than a test against a passive difficulty). You attack with Combat (repull Gunnery) and evade with Physical (repull Piloting). Weapons have an arc. If any portion of a plane’s base falls within that arc, they’re a legal target. Exception: If you’re within a base width of a plane and they’re on another elevation, they may not be targeted. If your target’s in range band 4, they gain a +1 bump to their defense test. If your target’s Low and you’re High (or vice versa), they gain a +1 bump to their defense test. As usual, Defenders win ties. However if an attacker tie a defense result, they gain a +1 boost to any attack they make on the same plane in the following turn. If a plane has three or more “armor upgrades” they lose ties on defense. Planes which have taken a stressful movement have a -1 to actions (but not to reactions). If you hit, you do your weapon’s fixed damage. In order to do your full damage, you must invoke an aspect on the target. This can be a free invocation or cost a fate point (for example from environmental effects or damage consequences). If you do so, you do your fixed plus your rolled damage. If an allied plane is in contact (or really close by) a targeted plane, you will hit them if you miss your shot (Law of Dramatics). The same goes for bad guys though. Mark Off Damage Boxes: Mark off one of your plane’s Damage Boxes. This takes care of that much damage. Suffer Plane Damage. You can take Minor (2 pts for 1 card), a Moderate (4 pts for 2 cards), and a Severe (6 pts for 3 cards). Plane Damage cards get shuffled into your deck. They can be repaired after a fight. If you draw a Plane damage and can’t draw past it, you can either take a BLACK X or concede the fight and pull away to safety. If you gain three BLACK X’s your plane’s destroyed and you eject, with all that entails. Take a Random Hit: Reduce the damage taken by three. The GM rolls on a random effects table. Pilot Hit: You may take damage on your character. For every one point you mitigate, your character takes two damage. If you cannot or do not want to deal with the damage, your plane is taken out. If you opt to concede and pull out of a fight, you’ll gain Fate points based on the # of Plane damage, Consequences and system damage from random hits you’ve taken.